Before you break out that cute pumpkin costume you bought, be mindful about your pet’s comfort. Costumes with hoods or head coverings may block your pet’s vision and cause them to panic. If you need to, modify the costume so that your animal can see, hear, and breathe properly. Make sure there aren’t any choking hazards attached to the costume and that your pet doesn’t become overheated. With all the Halloween decorations in your house, your pet might get a little too curious. Make sure your four-legged friend doesn’t chew on any electrical cords. Keep any choking hazards, like fake cobwebs and bones, far away from your pet. Who doesn’t love seasonal fall candles? Well, your pet probably won’t if they accidentally burn themselves on one. Pet parents should swap out their wax candles with electric flameless candles or stringed lights. Keep your trick-or-treat bowl in a place where your pet can’t reach it. As you already know, chocolate treats are toxic to pets but sugar-free candies contain xylitol, which can prove harmful to your pet’s liver. 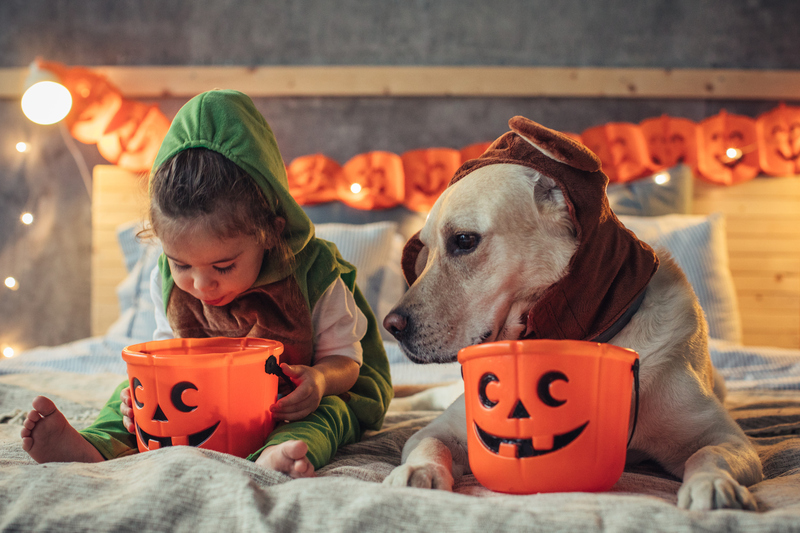 You should also check to make sure your pet isn’t eating off your jack-o-lanterns, as uncooked or moldy pumpkins can cause gastrointestinal problems. Call your veterinarian right away if your pet accidentally eats your Halloween candy or pumpkin. The night of Halloween, you can make a special stash of dog or cat treats so that your pet doesn’t miss out on the spook-tacular fun. The scariest thing that can happen to pet parents on Halloween is for their pets to run out the door while they’re tending to trick-or-treaters. Always keep an eye out on your pet. The best thing you can do is ensure your pet is wearing an ID tag or a microchip in case he or she gets lost. Talk to your vet about microchipping options if you haven’t already. Halloween night is bound to be filled with exciting costumes, treats, and activities but don’t expose your pet to too much excitement. Don’t take your pets trick-or-treating; scary house decorations and costumes may make them uncomfortable and feel on edge. Instead, create a calm environment for your pet that has a bed, water, and pet-friendly treats. Our PET GAZEBO® will give your pets the space they need to relax, get fresh air, and reassure pet parents they’re safe and happy. This easy-to-assemble kennel is perfect for the family that likes to lounge at home or be on the go. Read our article to learn more about the PET GAZEBO®. Be anywhere you want to be with your pet. Visit AdvantekPet.com to view our products or contact us if you’re interested in carrying our products in your store.